As a monitor in the List Gallery, I have the privilege of spending 2.5-3 hours each week surrounded by a varying landscape of paintings, drawings, and sculpture. This year, I’ve feasted my eyes on colorful seascapes, mysterious forest scenes, intricately made family quilt paintings, sculptures both colorful and monotone, and many more. All the while, I’ve gobbled up every visual treat. This week’s shift was no exception. Thursday’s reception kicked off the 2013 Senior Thesis Exhibition Series, a set of five exhibitions held weekly in the gallery. From Thursday to Tuesday each week, an exhibit will display the talents of one or two senior studio art students and expose the Swarthmore community to the skills of their own classmates in a variety of media. Sarah Diamond’s oil painting show starts the series off with a bang. Spanning two years of work, the paintings in this show demonstrate her incredible talent and sure, confident handling of paint. Sarah has created lovingly vivid portraits of important people in her life, breathing life into images of people she cares about. It’s quite the journey to walk throughout the gallery and observe the variations from Sarah’s core style that characterize some of the pieces on display. “Cariad in the Mangrove Swamp” is immediately notable. The first work in the show, it bathes its subject in dappled light, reminiscent of looking through shadows cast by leaves, creating patterns on the surface of the canvas that delight the eye with their complexity. While all of the works on display are colorful, expressive, and have a clear likeness to their subjects, some, such as “Carolyn at Chautauqua”, “Grandma Sleeping”, and “Grandma with Blue Eyes”, have a playful degree of abstraction in their execution that provides even more of a visual punch. “Carolyn at Chautauqua” reminded me of a Matisse portrait in the strange, unexpected coloration of the subject’s face. Sarah approaches her depictions of her family and friends with tenderness and sensitivity, refusing to sacrifice characterization for surface impression, or vice versa. 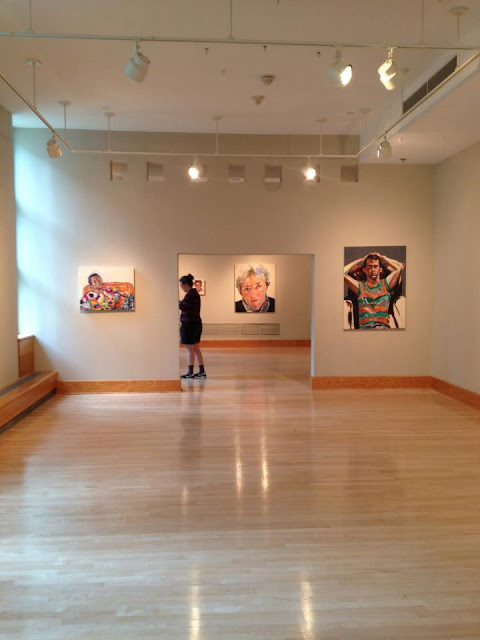 As the viewer enters the gallery, they see “Mom”, a large canvas dedicated to Sarah’s mother’s face, staring back at them from the back wall of the second room with a caring, maternal air. Smaller works such as “Sophie” and “Richard”, denoted as studies, capture the liveliness and spontaneity of both subject and artist. The self-portraits are also highlights of the show perhaps because they reveal different aspects of Sarah’s personality as an artist. The earlier portrait, “Self-Portrait in Blue Kimono”, depicts the artist as if thrust into a bright spotlight. Her face is turned in profile as her body is frontal, with arms held at about a 30 degree angle from her body. This work conveys a sense of defiance and strength masking vulnerability. Sarah has painted herself as looking away from the light and from the viewer. The colors are bright, shiny and glossy, the textures of flesh and silk defined and distinguished from one another. Her later self-portrait, however, takes a different approach. Sarah, clad in a more abstract, dark piece of clothing, gazes out of the work, interacting more with the viewer as she pensively, almost bemusedly runs her hand through her hair. Her face is contorted in deep thought. 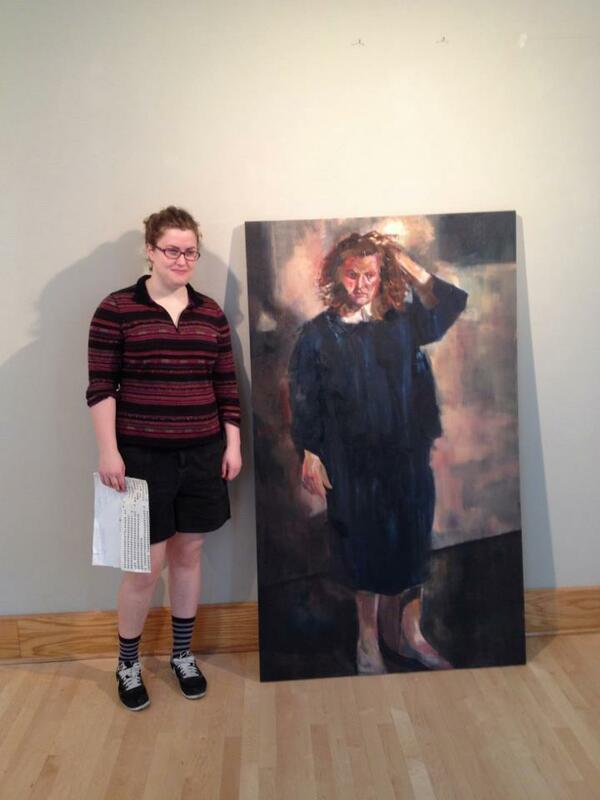 The portrait is titled “Self-Portrait, Senior Year”—perhaps she is ruminating on the path she has carved at Swarthmore, and wondering where her talent will take her next. Where the brushwork of the earlier painting was tightly controlled, here it is looser, more relaxed. Where the focus on the earlier painting was on the conglomeration of surfaces, here it is on Sarah’s own psyche. How appropriate that this engaging work closes out the artist’s solo show, as the viewer learns about the artist through her depiction of her family and friends and then through an intimate self-reflection. The exhibit closes Tuesday, April 23. It is not to be missed. A reception will be held Thursday, April 25, from 4-6 pm, to celebrate the next exhibit, “Alex Anderson: Elegant Emptiness”. These were impressive even in the photos on the List Gallery FB page...I can only imagine, based on this review, what they are like in person!